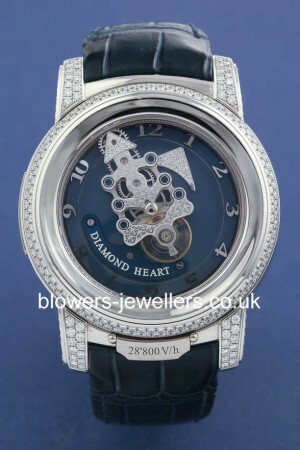 Platinum Ulysse Nardin Freak Ref 029-80 Diamond Heart. Limited edition of 99 pieces. 44.5mm case. Water resistant to 30 meters. Hand wound Calibre UN-200 7-day Carrousel-Tourbillon movement, wound by twisting of the case back. Platinum, and diamond bezel and lugs. Blue dial with skeleton numerals. Diamond hour markers. Approx 7 day power reserve. Blue croc with double folding white gold buckle. Box and papers dated July 2008. SKU: A1662. Categories: Ulysse Nardin.